Malaysian Cuisine is probably one of the most experimented cuisines in the world (and is still experimenting), with a fusion of so many other cuisines, along with its own kitchen resources. This is why it probably gave birth to a few the most sought-after dishes food lovers crave for. 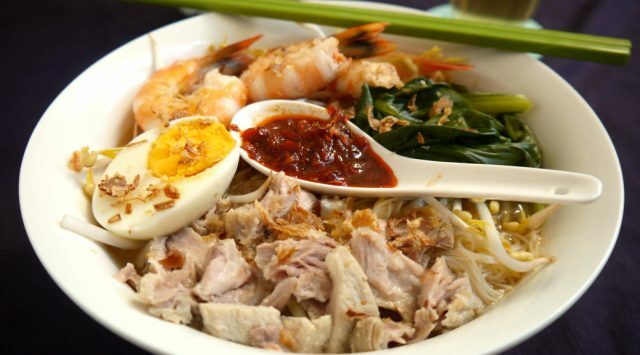 This choicest list of a few of the top foods from Malaysia assures to get acquainted to all types of representative dishes from the cuisine – starters to main courses, rice to bread, soups to desserts and sweets. What is it: This is the national dish of the country, and has been so popular that it spread across the boundaries of the Malaysia and reached in neighboring countries like Singapore, Brunei, and Thailand. 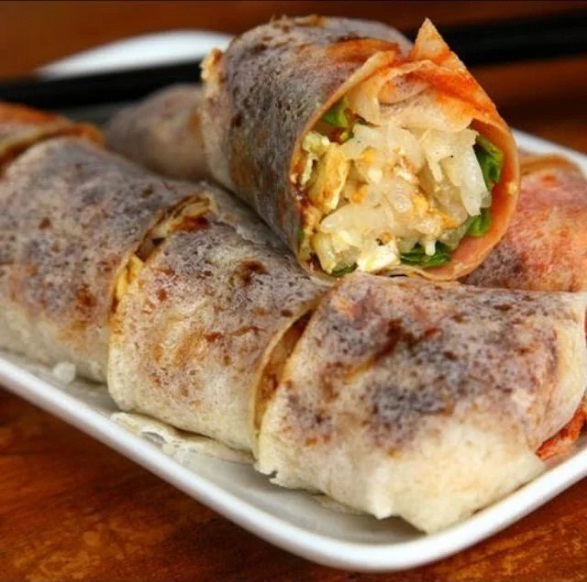 Not just that, it is also a popular street food that is found everywhere – in different fast food outlets, snack hawker stalls, restaurants, etc. – including commercial areas where people need to take lunch outside, so that anyone can stop by and fill up their stomach when hungry. This heritage finger food is cooked in coconut milk and pandan leaf (a widely-used Asian tropical herb for flavoring), and is usually served along with other staple side dishes. What does it taste like: The subtle fragrance of the flavored rice goes very well with the fresh aroma of the pandan leaves. Plus, the dishes served along with, enhances the taste of the rice to a higher extent. 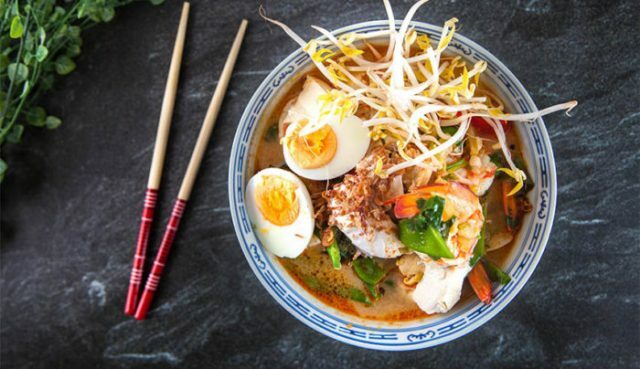 What is it: Basically a Chinese fusion, this good-old, popular soup dish is made of rice noodles or rice vermicelli and fish, chicken, or prawn cooked in a spicy soup based on coconut milk or sour asam, along with other herbs and garnishes. What does it taste like: This is not only a very healthy soup, relatively low in calories, but also has a rich taste of chicken/fish/prawns that combine very well with a lot of greens. 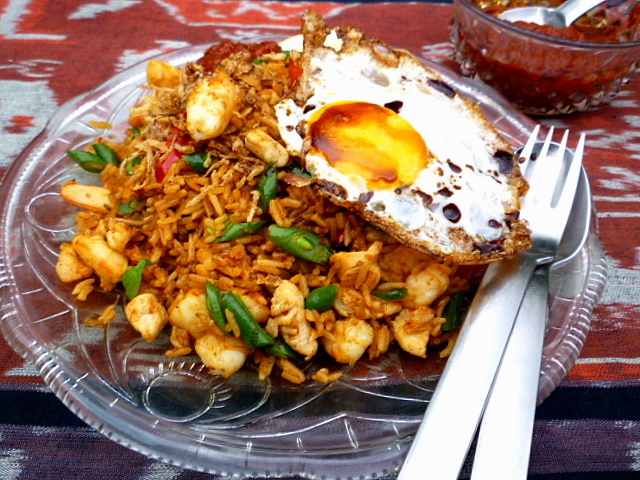 What is it: Nasi goreng, in Malayan language translates to ‘fried rice’. Hence, the name suggests it all. This famous rice dish is cooked in an open pan, stir fried with pieces of meat and assorted vegetables. However, the customized vegetarian version is very much available. What does it taste like: The fragrance of aromatic rice is a delicious combination with the local spices of Malaysia, mixed with a lot of vegetables, and a typical fermented sweet soya sauce. 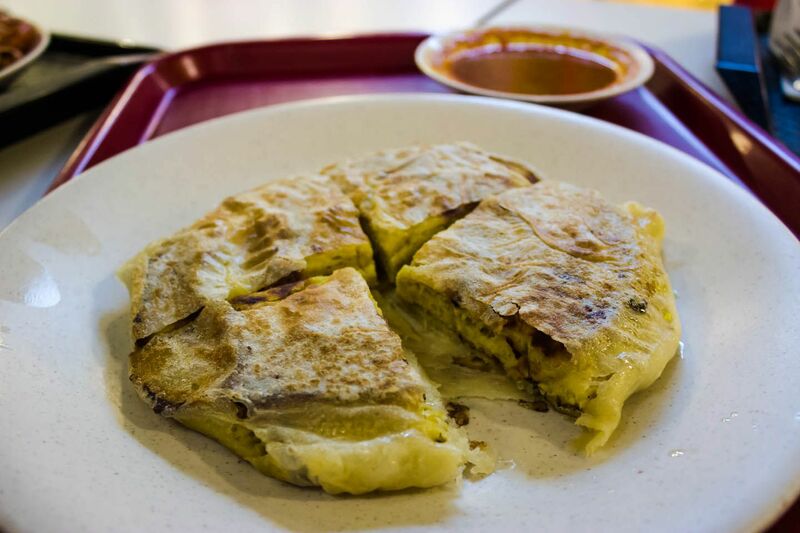 What is it: This item is a kind of semi-fried intermediate between the ‘roti’ and the ‘paratha’, both of which are flatbreads with Indian origins. While roti is roasted on a flat pan, parathas are fried with a little oil or clarified butter. 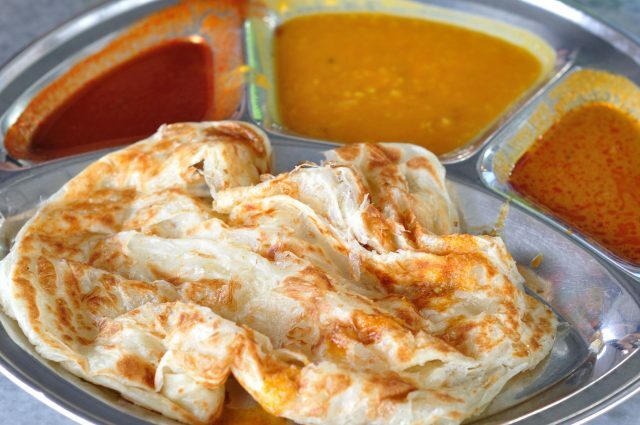 Roti canai, a healthy preparation even good for the diabetics, is highly popular in Malaysia (as also, in the neighbouring Singapore). What does it taste like: The tenderly fried roti has an excellent chewy consistency and matches best with dhal, fish, chicken or vegetable gravies. At times, it is also combined with sweets, condensed milk, chocolate cream, or even fruits like mango or banana, and is enough to engross you with its amazing aroma. What is it: Also written as bubur cha-cha, this is a versatile Malayan snack that can be eaten both as a dessert, as also, as for breakfast. 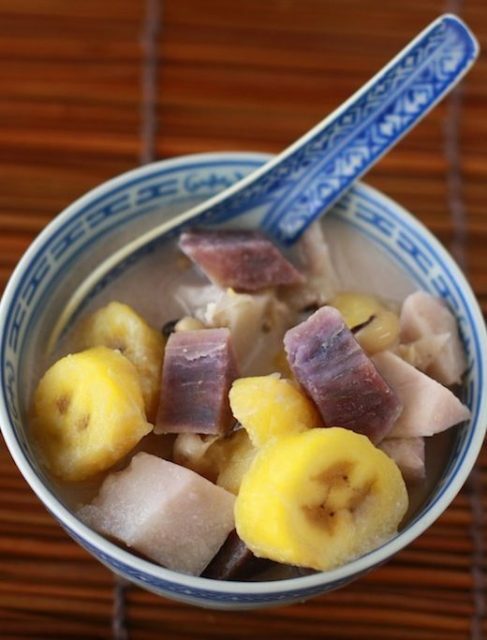 The ingredients are very interesting, with a combination of cubed sweet potatoes, pearled sago, bananas, yams, black-eyed peas, pandan leaves, coconut milk, sugar, as well as salt. What does it taste like: The variety of aromas that you will find in this dish will act together to give you a single flavor. The captivating fragrance of pandan leaves, with the smooth texture rendered by coconut milk, mixed with a sugar and some salt will surely surprise your tongue. 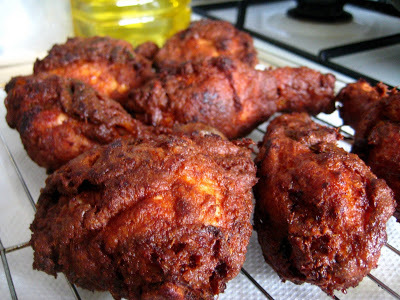 What is it: This chicken dish is an exotic one that is cooked almost everywhere. 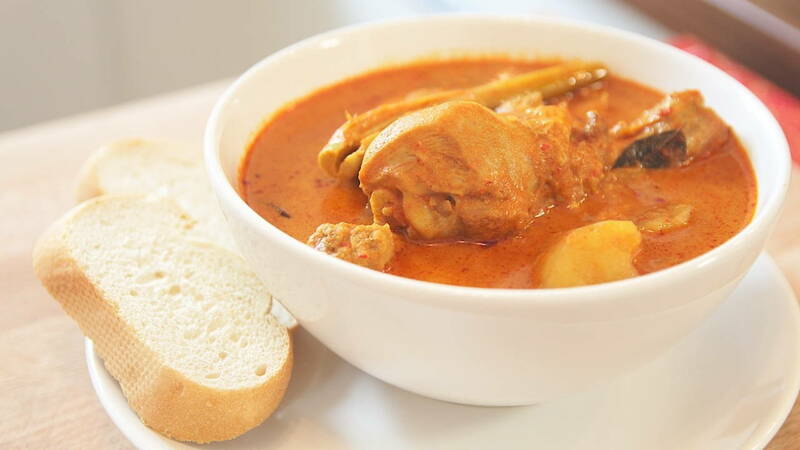 It is nothing but a chicken dish prepared with a lot of local Malayan spices, and has a different taste. So, this one is also one of the dishes you must try if you visit a restaurant in Malaysia. What does it taste like: The flavor of chicken is rarely so wonderful when it is mixed with such spices like lemon grass stem, white pepper, brown onion, coconut milk, and so on. What is it: Also called ‘terang bulan’ or ‘martabak manis’, it is a kind of griddle pancake that are readily available at the roadside stalls throughout Malaysia. This sweet snack is also served as dessert. What does it taste like: This snack has a very crispy texture, especially around the edges. The tender stuffings used are also equally great and a contrast with the folded crunchy envelope. What is it: This is a chicken leg curry with a light taste and is easily digestible. The main attraction of this dish is the spices and herbs used. What does it taste like: Chicken’s flavor has been used perfectly with cloves, ginger, garlic, cinnamon, cardamom, turmeric, star anise, sugar, coconut milk, etc., most of which are, again, common Indian ingredients that have a longtime impact in the cuisine of the country. 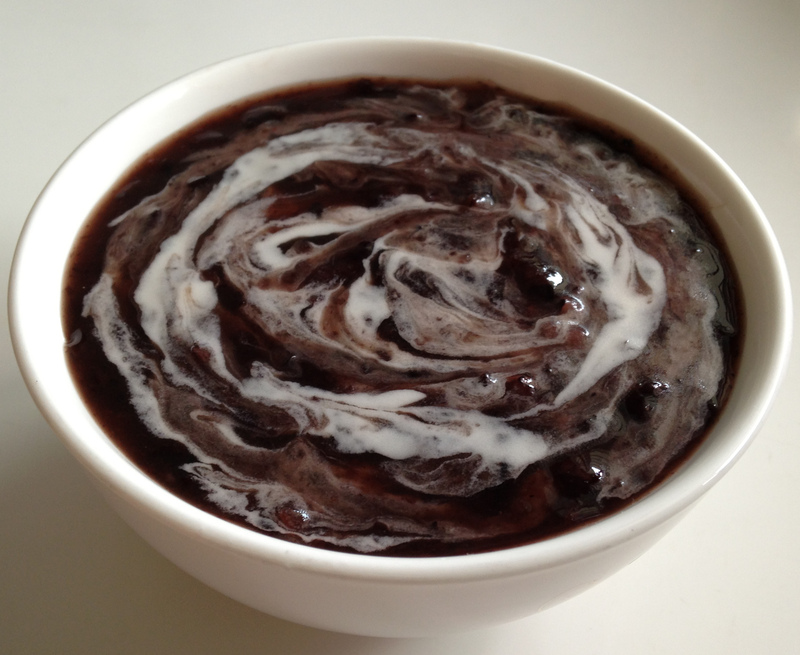 What is it: Also known in English as the “black glutinous rice pudding”, this sweet dish is known in other local names as well, including ‘bubur ketan hitam’ and ‘bubur injun’, and is a strange combination of black glutinous rice, coconut milk, cane or palm sugar, etc. What does it taste like: The flavor of scented black rice mixed with the milk of coconut is the primary secret of the unique taste of this porridge. What is it: This prawn or shrimp fritter dish is very popular in the country, and is prepared in almost households just as a snack, or as an accompaniment for tea or coffee. It is also a popular choice in gatherings and parties. 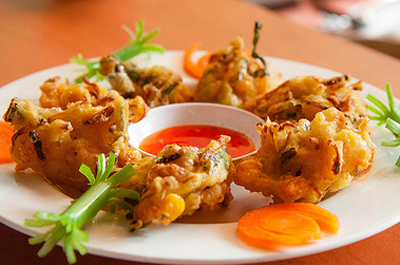 What does it taste like: The combination of hot chillies, tangy fish sauce, battered eggs, combined with the strong scent of the prawn with the garlic and onions, and the flavor of the ku cai leaves makes this crispy fritter a starter snack to die for. 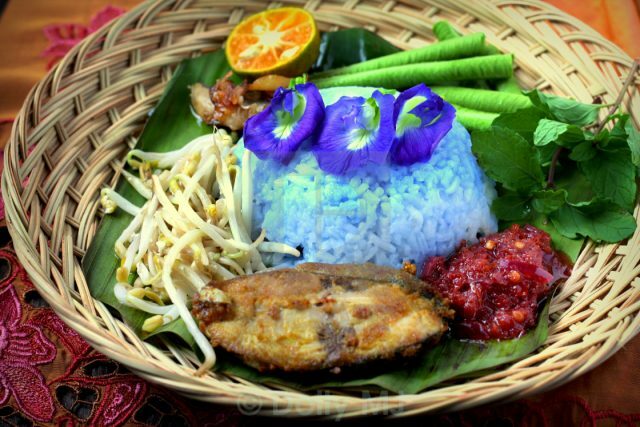 What is it: While scientists say, color blue in foodstuffs do not appeal to the eaters, Nasi Kerabu will break the notion in your mind! It is a very spectacular rice dish in which the color of the rice is blue. The pigmentation comes from the petals of the blue pea flower (Clitoria ternatea), common in the Indian subcontinent and other South Asian countries, which is used while preparing the dish. The intensity of blueness, however, depends upon the number of petals used. The blue rice is served along with customized accompaniments including fried chicken, dried fish, pickles, crackers, assorted salads, etc. What does it taste like: The rice is often served hot, and the flavors of spices used in the dish release the respective aromas perfectly. 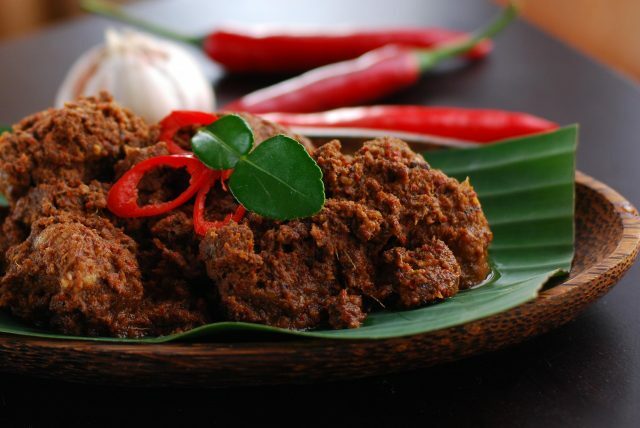 What is it: Also spelled as ‘Randang’, this is a typical meat dish from the country which is very hot and spicy, and is usually made from chicken, beef or lamb. It is frequently served at different ceremonial occasions, as also, to honor guests. What does it taste like: Mostly served with steamed rice or rotis, the taste of the dish is simply excellent. The aroma of the spices, especially the characteristic flavor of coconut, mixes fantastically with the tender and juicy pieces of meat when simmer-cooked in a very low flame. What is it: This one is a snack dish that you might want to try as street food in the stalls and outlets in Malaysia. 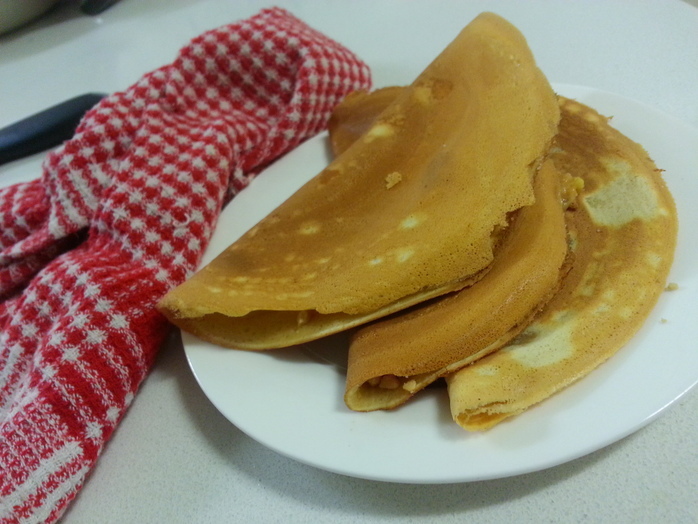 The filling is commonly made of shrimps; however, you might also get the meaty or veggie versions. What does it taste like: The outer cover is very crispy, and as you bite through, you will be surrounded by the appealing flavors of herbs, veggie greens, and so many other spices! 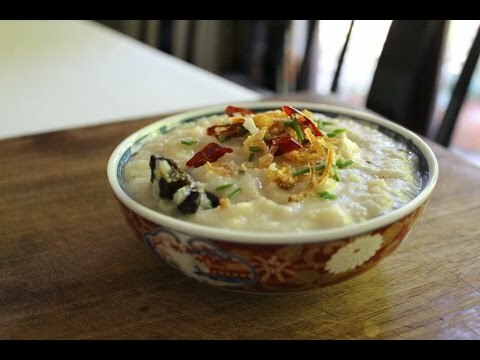 What is it: This dish is what is known in Malaysia and other neighboring countries as ‘Congee’ (translates to porridge). The menu is light, and hence, pretty healthy and easy to digest. 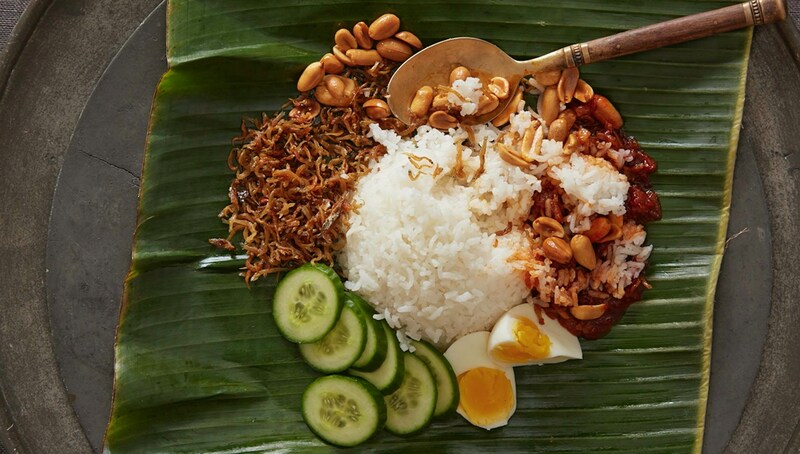 The dish is made of rice, chicken (or other meats), and several other spices typically common in Malaysian cuisine. What does it taste like: As you mouth a spoonful, you will surely be amused by the enchanting flavors of scented rice, meat, shallot, onions, and garlic. What is it: This dish is readily available almost everywhere, especially when you are famished shopping, and hunting for some yummy street food. It is basically pan-fried bread stuffed with minced meat and onions, and served with a spicy dip. What does it taste like: Right from the first bite, this snack will keep surprising you with its gratifying flavors of cooked minced meat, onions, the accompanying sauces, and other customized vegetables like cabbage, potato, etc. So this choicest list of a few of the most exhaustive Malaysian dishes, along with their local names, facts and photos, can be a great guide for the Malayan dishes you must try, especially if you are a confirmed food lover, and have a plan to visit this wonderful country!